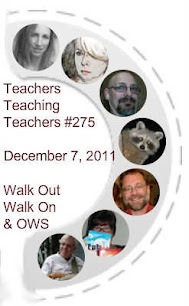 This is the second episode on Teachers Teaching Teachers [ http://teachersteachingteachers.org/?feed=rss2 ] in which we invite the ideas of Margaret Wheatley and Deborah Frieze's Walk Out Walk On http://walkoutwalkon.net to inspire our conversation. Are you a Walk Out? 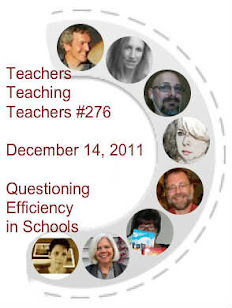 Read these couple of paragraphs from the book and Web site, then come join us on Wednesday, 12.21.11 for a chat room at http://edtechtalk.com/live-ttt and watch the LiveStream. ALSO - if you would like to join us in the Hangout soon, if you have read the book and would like to get in on the conversation directly, just let us know. Inside dying systems, Walk Outs who Walk On are those few leaders who refuse to work from the dominant values that permeate the bureaucracy, such things as speed, greed, fear and aggression. They use their formal leadership to champion values and practices that respect people, that rely on people’s inherent motivation, creativity and caring to get quality work done. These leaders consciously create oases or protected areas within the bureaucracy where people can still contribute, protected from the disabling demands of the old system. These leaders are treasures. They’re dedicated, thoughtful revolutionaries who work hard to give birth to the new in very difficult circumstances. And then there are those who leave the system entirely, eager to be free of all constraints to experiment with the future. You’ll read their stories in the next pages. But even though they might appear to have more freedom than those still inside, they encounter many challenges that restrict their actions. Old habits and ways of thinking constantly rear up on their path. It’s easy to get yanked backwards, or to doubt that this is the right direction. It takes vigilance to notice when these old ways of thinking block the path ahead. We begin a conversation about Margaret Wheatley’s and Deborah Frieze’s book, Walk Out Walk On [ http://walkoutwalkon.net ], and we explore how the Occupy movements and Educamps might reflect some of the principles in this book. We have been working on a quiet revolution the last four years in Colorado [ http://labconnections.blogspot.com ], both outside and in the public school system, in order to create the communities the authors, Margaret Wheatley and Deborah Frieze share and describe so poignantly, so beautifully in their book. Mary Ann Reilly joins us this week. Mary is also be inspired by Walk Out Walk On, and has been trying to get a group of teachers together to talk about the book. Mary is a progressive educator, artist, photographer, and writer of Deepening Literacy Learning: Art and Literature Engagements in K-8 Classrooms. [ http://infoagepub.com/index.php?id=9&p=p4b917a12e9f4a ] We are delighted when she is able to join our conversations at Teachers Teaching Teachers. I wanted to spark some interest and also to make this unit relevant for my students. To get started, I showed the students these two videos: “UC Davis Protestors Pepper Sprayed” [ http://youtu.be/6AdDLhPwpp4 ] and “UC Davis Chancellor Katehi walks to car amidst protesters” [ http://youtu.be/nmfIuKelOt4 ] These videos sparked some interesting discussion about non-violence and the violent reaction. Some students were shocked by the violence of the direct pepper spraying on the docile students, and the lack of reaction on the students’ part. Why did they just do nothing? Why didn’t they fight back? They also remarked about the silence on the second video. We talked about the impact of that silence and the effect of the sounds of the heels hitting the pavement. Again, someone questioned why they didn’t get up and get in the Chancellor’s face. Reading Walk Out Walk On, one can’t help but wonder if the Occupy Wall Street movement might a place to find “Communities Daring to Live the Future Now,” as it’s put in the subtitle of Walk Out Walk On. I’ve been bringing the Occupy movement into my work with Grade 5/6s studying government and protest (with videos, twinke fingers in the classroom, etc) As a member of the OccupyToronto Education work group, I can speak to the curriculum we're developing for schools around issues of social justice, and poverty. Enjoy and plan to join us for follow-up episodes on Walk Out Walk On in the coming weeks.